Leading Service Provider of encoder from Coimbatore. Owing to perfection and quality oriented approach, we have carved niche in the industry by offering Digital Encoder that is applied on the angle-measuring device and equipment. This encoder is a sensor that converts machinery positional information into corresponding pulse numbers. Offered encoder is properly tested on well-defined parameters by our quality experts in order to deliver a defect free range at customer’s end. 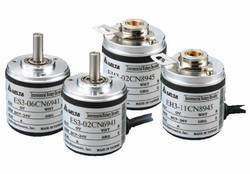 Our patrons can easily avail this encoder from us in a given time frame at nominal rates. Pulse Per Revelution : 100ppr-2400ppr. Soft Diameter: 4mm To 8mm. Outer Diameter: 36m To 50m.